Using bodies of standing water as garden decoration is not a new idea. The ancient Egyptians created lavish landscaped gardens with huge ornamental Lotus ponds. The Romans built intricate raised pools in the grounds of their villas. Famous 18th Century landscape architect, Lancelot ‘Capability’ Brown, and his contemporaries designed great ornamental lakes, complete with artificial islands, on some of England’s biggest estates. Human beings love to gaze into water, to watch its ripples and contemplate nature. 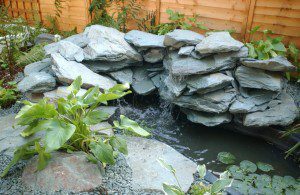 Even if you don’t have the budget or space for a grand lake or pool, you can still create your own garden pond relatively cheaply and simply. Ponds don’t just look good, they also encourage all sorts of wildlife into your garden, which is good for the garden and can be an interesting education for you. The cheapest way to build a pond is with butyl liner. This is available at pond and aquarium shops or can be ordered online for delivery to your door. Tell the assistant at the shop the size and depth of pond you want to create and they should be able to work out the size of liner you will need. Most on-line suppliers will have a handy calculator to help you work out your exact requirements. Wherever you buy it, don’t forget to buy the same amount of underlay, as this will protect the liner from damage and make it last longer. Creating your pond is fairly easy. Dig a hole to the size and shape you want your pond to be. Remove any sharp stones and tree roots from the bottom and sides of your hole and spread a 2-3 inch layer of soft building sand across the bottom. When digging the hole, you may want to leave a couple of ledges around the edge, at say 150mm and 300mm depths, which can be used to support marginal and aquatic plants. If you want the pond to support wildlife such as frogs and newts, put a gradual slope on one side to make it easier for the occupants to get in and out. Now simply lay your underlay and liner over the hole, with the hole in the centre of the liner. Loosely push the liner into the hole and then turn on your hosepipe in the middle of the liner. As the water fills the liner, its weight will pull it into the hole. As the pond becomes fuller the weight and pressure of the water should mould the liner to the shape of the pond. Try and pull out any wrinkles as it does, but don’t worry if you end up with a few folds and wrinkles – this is inevitable and won’t cause any problems. Now you need to trim the excess liner and underlay from around the edge, leaving a lip so that if there is any further stretching of the liner over time the edge won’t be pulled into the hole. Dress the edge with rocks, slate paddlestones or mortared down bricks to hide the unsightly edges. 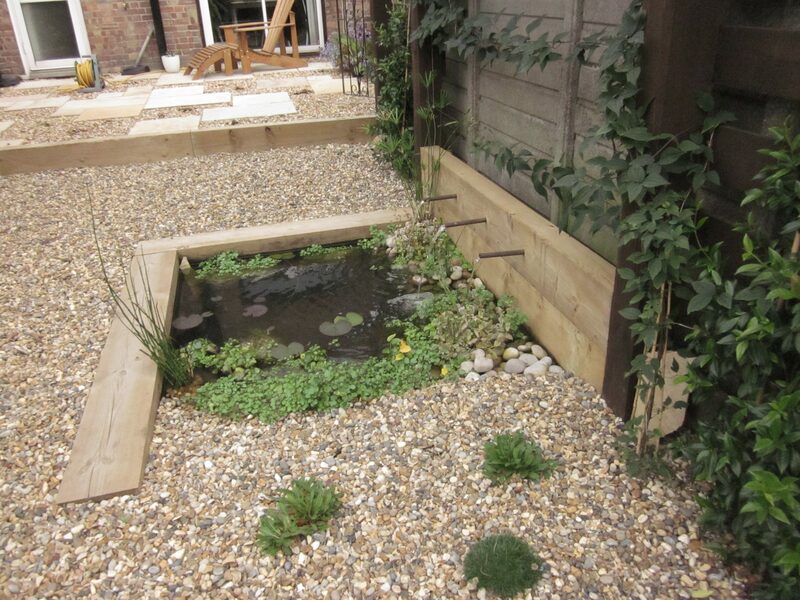 Alternatively, you could edge the pond with chunky railway sleepers, such as the one in the image above. Make sure you use new railway sleepers, as the tar and creosote in reclaimed railway sleepers will be highly toxic to fish and wildlife. Once edged, put in whatever aquatic plants take your fancy – your local pond shop will be able to help. If you intend to keep fish in the pond, you might need to install a pump to help aerate the water, as it can be difficult to create an effective ecosystem in a small pond (larger ponds, with lots of plant life, are often self-sufficient). Another way to build a pond is with a pre-formed liner, which are available in aquatic shops and many garden centres. These can be a little trickier to install, as you need to dig the hole to fit the shape of the liner, and have the disadvantage of being a set shape. The main advantage of these liners is that they are made out of fibreglass, so will be more durable than butyl and less prone to holes and tears. They also have formed edges, so don’t need edging to conceal unsightly cutting like butyl liner, although you may still want to edge with rocks or stones to create a more natural appearance. The more capable DIY enthusiasts could consider creating a raised pond with bricks and mortar. This is a more complicated method, and requires a degree of building skill. There are various books on the market that detail a whole range of designs of pond, and the internet is awash with advice on constructing a permanent pond. If you are feeling really adventurous, you could even construct a sunken concrete pond, such as this one we created in a garden in North London a few years ago.